The events which occurred in Ireland between 1912 and 1923 constitute a revolution, or at least a moment of revolutionary potential. If the state that emerged reflected the aspirations of many in that period remains a debated subject, especially as we move towards the centenaries of the foundations of both the Irish Free State (today the Republic of Ireland) and the state of Northern Ireland. In trying to create a canvas of Ireland in the last century, we found the revolutionary period an essential component of the story. In the spirit of National Treasures, the items which came forward provided new perspectives on a well-known national story. British mishandling of the Rising, and increasing hostility towards the seemingly never-ending war on the continent, played no small role in creating a newly radicalised populace. At Easter 1917, the first anniversary of the Rising was marked by large scale and illegal commemorations across the country, with a tricolour raised over the ruins of the General Post Office. The fear of conscription in 1918 brought hundreds of thousands of people into political radicalism, and swelled the ranks of the IRA. The Catholic Church, the trade union movement, Sinn Féin and others actively resisted the threat of conscription together, pledging to do all in their might to keep Irishmen from already infamous battlefields. Among the more curious social history items relating to this period in the National Treasures online archive are currency produced during the Limerick Soviet of 1919, the centenary of which will take place next year. 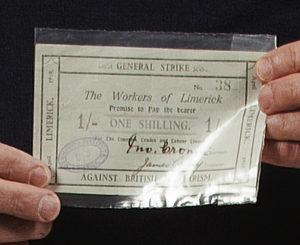 Essentially a protest against the British declaration of a "Special Military Area" under the draconian Defence of the Realm Act, this protest, from 15 to 27 April 1919, saw a Workers' Soviet essentially running the city of Limerick, distributing food and printing its own currency. It was a powerful demonstration of the impact of events in Russia on popular political terminology and discourse, and one of around one hundred so-called Soviets in Ireland during the revolutionary years. In Westminster, this was pointed to as "an example of the effect of Communist Propaganda from Moscow.” The currency was submitted by Gerry Casey, whose great grandfather was a leader of the Soviet. The idea of workers taking the Irish revolution into their own hands didn’t always sit well with republican revolutionaries; legendary republican leader and later Fianna Fáil Minister Dan Breen lamented the “supporters of the Red Flag regime” who tried to create Moscow and Leningrad in Mallow and Longford. A three year guerrilla war, like that fought in the hills and valleys of rural Ireland, could only be maintained with the support of a civilian populace. 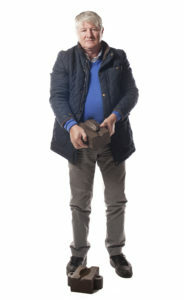 Items in the National Treasures collection that reflect that include a striking grenade that was produced locally in Cork, brought forward to the collection by Barry Curtin. The mould in which the grenade was made was constructed subversively by workers at the Ford factory, utilising their skills for very seditious purposes. While IRA HQ in Dublin included dedicated logistics and munitions experts, the war could only be sustained thanks to the network of covert munitions factories that sprang up in rural Ireland. Amidst the collection are deeply personal stories, not least in the context of the tragic Civil War. Take the chess set submitted by Dara Gannon, a relation of Irish republican Bill Gannon who took up arms not only in Ireland but in Republican Spain when Franco’s coup commenced in 1936. 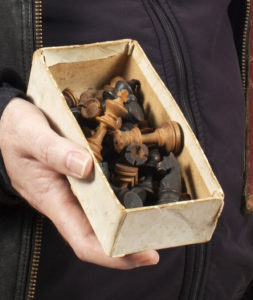 This chess set had a long chequered history, being played in Mountjoy Prison on the eve of execution by republican Rory O’Connor in 1922, and later played by Jack Nalty, who left Dublin for the Spanish Civil War and who wrote home to Dublin that “It's marvellous what men can endure in support of an ideal.” Nalty was killed in action in September 1938, with no body recovered. He died a veteran of two very different civil wars. The chess set brought moments of comfort into the lives of those who risked everything for their ideals, sometimes paying with their lives. For some, this period represented not the revolutionary movements of home, which filled the air with electricity, but the trenches of France and Belgium. They too are remembered in the collection. 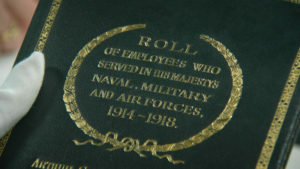 A lavishly illustrated memorial book from Guinness commemorates the hundreds of brewery employees who enlisted in the war effort, while Alice Hickey’s sewing machine demonstrates the challenges faced by those left behind. When her husband Gunner Tom Hickey was struck down in the war, Alice had to find a way to fend for herself economically. In the words of Alice Carol Clancy, who submitted the machine, it “kept the wolf from the door.” For many people in the days of the hungry Irish revolution, that was undoubtedly the leading priority. Donal Fallon is a historian and author based in Dublin. 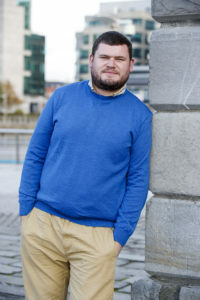 He is editor of Dublin social history blog 'Come Here To Me' (www.comeheretome.com) and teaches with the Adult Education Department of University College Dublin. His publications include a forthcoming guide to revolutionary Dublin 1913-23 (Collins Press) and a history of the Nelson Pillar (New Island, 2014). He is a regular contributor to Newstalk radio.